If plaque is not removed from your teeth, it can absorb mineral from your saliva and form a hard deposit, tartar. 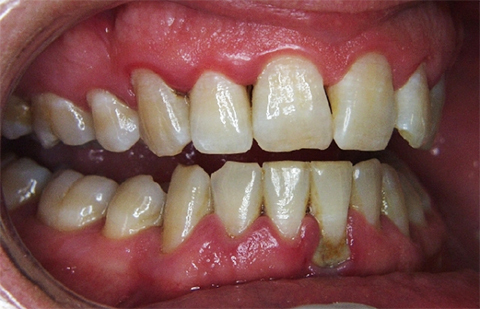 Bacteria thrive in and around this plaque and tartar, and attack the gums. They initially cause them to become swollen and inflamed, causing bleeding. They then begin to attack the attachment between the gum and tooth. This results in a pocket around the tooth beneath the gum line. Plaque and tartar forming within this pocket will allow bacteria to further thrive under the gum. These bacteria will continue to attack the tooth’s attachment, causing the pocket to deepen, and eventually resulting in the tooth becoming loose. The gum may also recede in these areas. Regular and thorough cleaning, both by yourself and our dentists and hygienist, will remove this plaque and tartar and help to prevent gum disease. There are, however, some other risk factors for gum disease, including smoking and diabetes.